Sussex Cricket has agreed a limited-overs only contract extension with batsman and Vitality Blast captain, Luke Wright - spelling the end of his red-ball cricket days. The deal comes into immediate effect with the 34-year-old available for selection for Sussex Sharks in one-day and T20 cricket from now on. After playing five times for Leicestershire, Wright joined Sussex in 2004 and played 139 first-class matches for the county, scoring over 7,000 runs at an average of 38. He was part of the County Championship-winning sides of 2006 and 2007 and captained Sussex in 11 first-class matches between 2016 and 2017. Following his retirement from first-class cricket, he said: “I worked hard on my red-ball cricket over the winter, but once it became clear that I was going to have a lesser role in the four-day team, it made sense for me to commit my long-term future to the white-ball game only. “I’m hoping to carry on playing for the next five to six years and therefore I’m delighted to be committing my future to Sussex with this contract. “I’m hugely proud of my first-class record – it’s something that has often surprised people who think of me as having been a white-ball specialist - and I was lucky to join Sussex under Peter Moores and Chris Adams ahead of a period of unprecedented success for the county. “I’ll miss first-class cricket greatly and would always advise any youngsters making their way in the game that four-day runs are always the most rewarding. “Dizzy and Browny have my full support going forward and I believe in what they’re trying to achieve with this exciting young team. “I’m looking forward to getting stuck into the Royal London One-Day Cup next week and building on the fantastic T20 cricket we played last year when the Vitality Blast campaign gets under way in July. 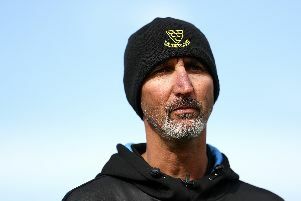 Sussex head coach Jason Gillespie said: “I’m delighted that we’ll be benefitting from Luke’s skills and leadership in the shorter forms of the games for the years to come. He’s in great shape and I’m sure he’ll be playing for a long time yet. “I sat down with Wrighty at the end of last season and he was keen to work over the winter to try to cement his role in the four-day side. He missed out on selection for the first game with a couple of the other lads given an opportunity and he has been very selfless in making way for other players to come through.